Doctor Strange #388 Review – AiPT! Cates manages to find ways to start bringing home dangling thematic questions about Stephen Strange. While my senior colleague David is taking care of the Damnation primary series beat, being a newer denizen to these parts I thought it would help to turn our attention back to the ongoing Doctor Strange series, which is currently devoted to sticking with our hero’s perspective in Damnation and covering what’s going on in his mind, soul, astral form, dreams or whatever part of him we are actually experiencing. 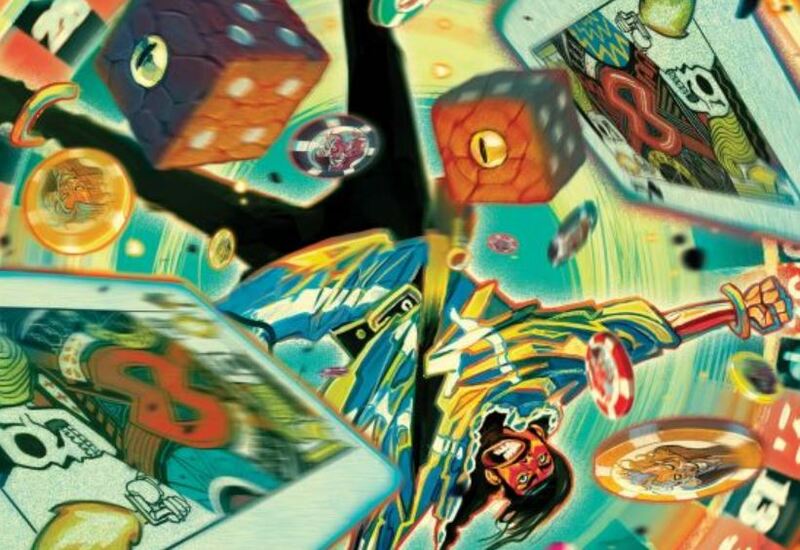 A recap of sorts is in order: in the wake of everyone’s most recent favorite controversial Marvel event, Secret Empire, the Sorcerer Supreme tried to make penance for his increasingly destructive and harmful behavior over the course of the last few years by attempting to resurrect Las Vegas and all of its denizens. Instead, he ended up inadvertently bringing Hell on Earth, along with Mephisto, its King, and a bunch of contagious demons along with him that claim new victims whenever minor sin occurs. So then, in once again trying to make penance, he tried to trick Mephisto into leaving, only to end up losing his soul and that of a few Avengers he had brought with him in the process. (See a pattern here? Strange just seems to keep failing!) This series of events has spilled over into a number of tie-in books that include Iron Fist, Ben Reilly: Scarlet Spider, and a one-shot Ghost Rider special. Throughout this entire series, from Jason Aaron to Dennis Hopeless to John Barber to now Donny Cates, this has been the question that has gotten louder and louder until Strange is in a position where he has no choice but to answer it. And sadly, instead of answering it, he basically runs away from the question yet again and tries embracing a fantasy, despite Bats’ best attempts to prevent him from doing so. And so, on the surface, while the “shock” ending appears interesting, I can’t help but wonder if Strange is essentially still in exactly the same position he was at the end of the last issue, just even more delusional than before. While the allies that appear in this issue are different than those that appeared at the end of the last issue, there’s nothing that has proven they are any more real than the previous set. Perhaps Mephisto’s mind and soul control has its own “levels,” in a Hell-version of Inception? One thing that I’m incredibly appreciative of with Cates’ writing is just how much he nails the quippy Strange voice that Aaron established. In addition, what he’s added with his own creation, Bats the talking dog, is downright hilarious. Strange’s former librarian and apprentice Zelma, who was created by Aaron back in the first issue of the new series to serve as an audience surrogate and comic relief at times, seemed to have left Strange’s life for good before this event. However, Cates’ decision to keep Bats around has served the story well and especially in this issue, we see how important it is that his mere presence seems to prevent Strange from losing his marbles completely. Interestingly, when you think about it, Bats doesn’t actually do anything. Unlike Zelma, who kept doing what Strange asked without question, and Wong, who knows him better than anyone and served as a sidekick of sorts, Bats is just…there, by his side. Sure, he will take some risks, but at the end of the day he’s taking risks in the vein of any dog loyal to its owner. In some ways, I have to wonder if Cates wanted his own surrogate, but rather than an audience surrogate, Bats was created to be a stand-in for Cates himself, just innocently hanging around and asking theoretical questions and trying to get Strange to listen (and perhaps sometimes randomly urinating on people’s legs). Either way, he keeps what could easily become an incredibly depressing story from becoming too dark while still being much more than simple comic relief. The art continues to be consistent and is a perfect fit for the story, as the flowing nature of Niko Henrichon’s art works well, especially for the demonic splash pages. His take on the surprise ally at the end is rather interesting and reflects a strong amount of restraint that is also present in the splash pages, as most people tend to draw this character with great fanfare and almost go overboard. Henrichon chooses to draw attention to other elements that could prove valuable (if Strange isn’t still seeing an illusion, that is). Henrichon also doesn’t rely on angles and given that Strange is supposed to be in Hell of some sort, it makes sense for the scenes and the characters to appear floating and almost dreamlike. The scene where Bats and Strange have the heart to heart is brilliant and jarring precisely because of its simplicity – for just a moment, Henrichon and the color assistant, Laurent Grossat, put away the paintbrush and just focus on the two characters in an empty void. Just as the writing tries not to take itself too seriously despite the circumstances, the art also follows suit. While I normally hate crossovers, from what I have read of some of the other tie-in books it seems that one could actually get by just fine if you stick to your book of choice since there are adequate recaps of varying lengths that lay out what’s going on in each tie-in title. It seems then, that the setup is having Damnation as the primary event, while the other books, including Doctor Strange, are focused more on character exploration by using the Damnation event as a vehicle to ask tough questions about whether each of these so-called heroes are actually good people or not. This is totally fine by me since I love character exploration, and what has appealed to me about this title since the now-departed Jason Aaron launched the current volume back in 2015 is that there is a running theme and an overall downward trajectory (referring to the character, not the quality of the book) that every issue has been following (even in the face of company-wide events and crossovers). This downward trajectory for Strange has now culminated in its most logical endpoint, which is Hell, and who better to serve as the antagonist than Mephisto himself? There are only a few issues of this current volume left, and Cates’ time is winding down as he will move onto Venom while Mark Waid will take over the world of Doctor Strange. Even in the midst of a crossover event (which I’ll admit is convenient that he is co-writing), Cates is managing to find ways to start bringing home dangling thematic questions about Stephen Strange as a character that has always been present since the start of this volume. We already know the answers will be uncomfortable and we can intuitively guess that one way or another things won’t end well for the Doctor, but it takes a master of this medium to keep us on the edge of our seats wondering exactly how uncomfortable. As the volume winds down, even in the midst of a crossover event Cates manages to find ways to start bringing home dangling thematic questions about Stephen Strange as a character that have always been present since Issue #1. Cates continues to nail Strange's quippy and dry voice. Bats the talking (astral) dog is just everything. Just as the writing tries not to take itself too seriously despite the circumstances, the art also follows suit. It truly feels like we are nearing the culmination of Stephen's character arc for the last 3 years.